The Gaithersburg bedsore injury attorneys of Nursing Home Law Center LLC prosecute claims against negligent nursing homes on behalf of those who have suffered unwarranted injuries because staff members were ill-equipped to provide the very routine care needed to prevent the development or progression of pressure ulcers. It takes neglect on an incredulous level to allow patients to develop these wounds unabated or undetected and it is our goal to effect change in the industry by making it known that the disregard for patient rights and safety will not come without severe consequences. The city of Gaithersburg is one of the fastest growing cities in the state, seeing population growth of 12.6% in the last five years. Seniors make up over 9.5% of its total population of over 67,000 residents and it is expected that this figure will grow with the retirement of many Baby Boomers in the coming years. In order to provide programs tailored specifically to the needs of the aging, the city of Gaithersburg operates the Benjamin Gaither Center for residents over the age of 55. For a nominal membership fee, residents can enjoy the opportunity to mingle with peers during social events or while enjoying nutritious meals or to remain physically active and mentally astute through the available exercise and wellness programs and numerous educational courses. Support groups and free health screenings also help aging residents learn how to manage and cope with the challenges they are facing as they age. To learn more about the Benjamin Gaither Center, you can visit https://www.gaithersburgmd.gov/services/senior-activities. If you are looking for a nursing home that will treat your loved one with the respect and dignity he or she deserves and place a priority on the needs of every resident, you will need the right tools to eliminate negligent and unqualified facilities from your list. Our Gaithersburg pressure sore lawyers direct people to the nursing home compare tool offered by Medicare at https://www.medicare.gov/nursinghomecompare because it allows you to quickly determine which nursing homes should be crossed off of your list while helping you determine which comparable homes are suited best to your loved one’s unique medical and financial needs. You can search for facilities using criteria such as location, facility type and whether certain payment forms are acceptable. This will allow you to make informed and confident decisions regarding the place you choose to trust with your loved one’s care. If your loved one is suffering from advanced stage bedsores, it would have taken a prolonged period of neglect for his or her wounds to form and progress into open ulcers. While it only takes hours for sores to form, caregivers can greatly reduce the risk of pressure sores through routine monitoring and by moving patients at regular intervals. While moving patients, staff members can also determine whether the patient has any existing sores and take action so that they do not become any worse. The only way that most bedsores can become so severe is when caregivers are so overworked that they ignore patients for extended periods of time. An advanced stage pressure ulcer may take weeks to progress into an open and infected wound and it would be unfeasible for any attentive and skilled nurse not to notice the signs. 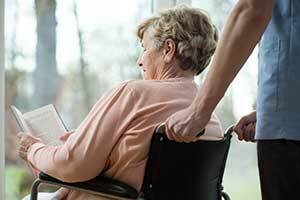 Nursing Home Law Center LLC is committed to defending the rights of those who have suffered in silence due to the systemic neglect and disregard for their needs. If your loved one has been injured, we would like to invite you to contact one of our award winning Gaithersburg bedsore injury attorneys today so that we can review the details of your claim and let you know more about your legal options and the various ways we can assist you. If for any reason we are unable to secure compensation on your behalf, you are assured our services will be free of charge.